Occasionally I find myself retracing a boyhood route, or part of a route, through my old neighborhood. With my father, or Uncle Harry, I used to head up Sixth Avenue in Greenwich Village toward the 8th Street Bookshop, lose myself for a while at Discophile, the classical record store, then hit some of the used book dealers that constituted Booksellers Row along Fourth Avenue and Broadway. More often than not, we ended up at the Strand bookstore. 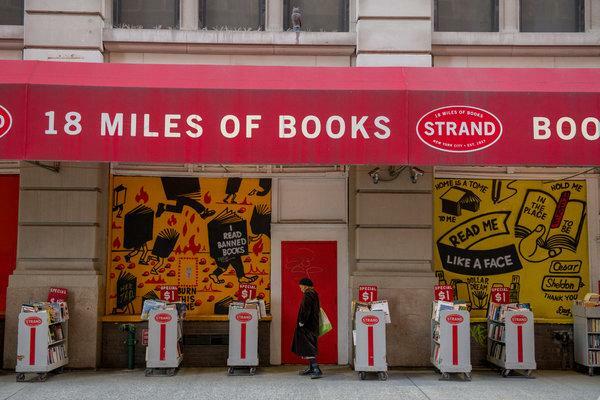 Save for the Strand, the city’s biggest and most famous indie book shop, nearly all the rest is long gone, like the small-town, scruffy Village of the 1970s. What’s there now is a scrubbed, wealthy enclave punctuated by new luxury high rises and vacant storefronts. You might think this would make the site of the Strand a no-brainer for landmark status. But its third-generation owner, Nancy Bass Wyden, is having none of it. Rallying its devotees, she has been scrambling to keep her beloved shop’s 11-story, 1902 Italianate building, 828 Broadway, designed by William H. Birkmire, off the city’s registry of designated landmarks. She says that landmark regulations would saddle her unionized, thin-margin business with potentially crippling burdens. That’s not generally the effect of landmark status. Surveys show lower commercial vacancy rates in landmark areas of the Village despite the extra bureaucracy — and in any case, the designation for 828 would exclude the interior of the Strand’s building, which is to say the actual shop, applying only to its exterior. Along with 828, with its three-story limestone base, metal cornice and terra-cotta details, the city’s Landmarks Preservation Commission is considering six other historic buildings along Broadway just south of Union Square. A final public hearing is scheduled for Feb. 19. If I had to guess, I would say that all seven buildings will be designated, and fairly so. Built between 1876 and 1902, and most elaborately decorated in Romanesque and Renaissance Revival styles, they’re distinguished Gilded Age relics from a period when Broadway below Union Square was an emerging garment district. What are we trying to save when we talk about preserving the city’s cultural heritage? Buildings like these are part of it. But there’s also what happens in and around buildings, on city streets, in neighborhood shops and storefronts. Village preservationists had beseeched the commission to consider landmark protections for a much wider swath of the neighborhood — 193 buildings — after City Hall announced plans in 2017 to erect a 21-story glass-enclosed tech hub on Union Square, a last straw, it seemed, to many aggrieved Villagers, in a neighborhood besieged by development pressures. The commission agreed to consider these seven. They are not necessarily the most endangered. As it happens, 828 is twice the size of what zoning regulations allow for the site, meaning that a building only half as tall could replace it if it were demolished, an unlikely scenario, as Ms. Wyden has pointed out when arguing against designation. She suggested I speak with Rachel Karr, her neighbor, to hear a different view. So the other day I stopped into the oldest of the seven buildings, the L-shaped, cast-iron 836 Broadway, with its pair of Second Empire facades, on Broadway and 13th Street. Ms. Karr, its owner, also inherited the family business, Hyde Park Antiques Limited, on the ground floor. New York officials recently anted up billions of dollars in tax incentives to entice Amazon to open a headquarters in Long Island City — one of the last companies in the world to need the money, not to mention the Strand’s biggest competitor. Coming in the midst of the designation fight, the Amazon giveaway suggested to Ms. Wyden a city traitorously kowtowing to a predatory monopolist posing an existential threat to neighborhood retailers, while burdening local underdogs and mainstays like the Strand. She’s not alone in seeing the city that way, with so many mom-and-pop shops disappearing, online retail and luxury development dismantling neighborhood ecologies, and commercial landlords leaving countless storefronts empty rather than renting them to small, legacy businesses that can’t afford what banks and drugstore chains pay. But this is not the same thing as safeguarding the city’s cultural, social, economic and political heritage. The emphasis is on buildings and places, not what takes place inside them. In 2015, the commission designated the Stonewall Inn on Christopher Street. Half a century ago, a police raid on Stonewall became a pivotal event in the national movement for gay rights. By making the site a landmark, the commission honored Stonewall’s profound cultural and historic legacy. But designation doesn’t mean that the inn couldn’t be turned into a nail salon tomorrow. It means that the building’s brick veneer facade and Home Depot picture windows cannot be altered without city permission. Three years ago the commissioners designated the neon Pepsi sign in Long Island City, a longtime pop cultural artifact overlooking the East River. You almost need a graduate degree in semiotics to grasp the logic by which the commission now regulates the sign’s configuration of letters, symbols, font style and supporting armature but doesn’t, technically, protect the name Pepsi-Cola — which those letters spell out — or the image of the Pepsi bottle, because doing so would mean regulating a business. That’s because — the city being a free market — the government isn’t supposed to tip the scales for one business or another. Of course that’s exactly what New York did for Amazon. Speaking before the commission, Ms. Wyden’s lawyer, Alexander Urbelis, floated what he called a modest proposal. “Let the city offer some incentives and abatements that might offset the costs and encumbrances of landmark status,” he said. With its focus on architecture, landmark designation is clearly a blunt instrument for preserving cultural heritage in all its diversity — what the urbanist Jane Jacobs called the “enormous collection of small elements,” including local shops, that ensure “a lively city.” For ages, city officials have wrestled with the related issues of small business preservation and vacant storefronts. The mayor has lately talked about taxing empty retail spaces. Year after year, the City Council has debated commercial rent control. A rent control bill promoted by anti-gentrification advocates called the Small Business Jobs Survival Act would require mediation between tenants and landlords when leases expire. You may ask what this has to do with the Strand and 828 Broadway. Ms. Wyden and Ms. Karr are fortunate, owning the buildings out of which they run their businesses. Most neighborhood retailers lease space. For them, the combination of Amazon with today’s commercial rents — which, though falling lately, remain high — acts like a one-two punch. Without turning New York into Rome, the city clearly needs to recognize neighborhood fixtures and local businesses as examples of what Jorge Otero-Pailos, director of historic preservation at Columbia University, defines as “intangible heritage.” The issue isn’t only economic. It’s also cultural. Call this the next frontier for preservation, Amazon’s handout being the 21st century version of the demolition of the old Penn Station. Those stores on my childhood walk, like the 8th Street Bookshop and Discophile, weren’t just places to buy stuff. These were community hangouts, de facto debate clubs, places of outsized local pride — magnets for the sort of face-to-face encounters that bind neighbors and societies together. This is what the Strand remains for many people, a bulwark against the online tsunami. As a child I would hang out among its bookcases and read for hours with my father or uncle. I do the same with my children today. Brad Lander, a city councilman, has put forward a proposal to grant tax breaks to commercial landlords who give affordable, long-term, renewable leases to independently owned small businesses. New York might look to San Francisco, which has experimented with rules requiring chain stores to apply for permission to lease retail spaces in districts that want to advantage homegrown businesses. San Franciscans also approved a ballot initiative in 2015 establishing the Legacy Business Historic Preservation Fund. In effect, endangered local businesses and storefront nonprofits, around for at least 20 years, can apply to the fund for grants sufficient to bridge modest gaps between survival and loss, but not so big that they salvage a destitute enterprise. “What’s being disrupted now by companies like Amazon is not just old business models but civic culture,” Mr. Otero-Pailos points out. Put differently, if Amazon gets $3 billion, it hardly seems the death of capitalism to give a little help to a few deserving bodegas and other neighborhood tent poles, whose loss feeds the narrative of a soulless city in thrall to wealth. Ms. Wyden may lose the argument about designating her building, but her bookstore might be just the springboard New York now needs to think more broadly about the true meaning of cultural heritage.